Based in the adventurer’s playground of Colorado Springs, Adventures Out West offers a variety of packages for every passion, ability level and age group — whether you’re seeking an adrenaline rush, joyride or horseback excursion. Because out here, adventure is a way of life. Read on for more ways to discover what Adventure Is … Out West. Ready to have your hair blown back? These heart-stopping experiences will show you a thrilling new side of Colorado. The best part? They’re all easy day trips from the Front Range. Fact: Not all ziplines are created equal. If you’ve ever been bummed by short flights and artificial platforms, the Pikes Peak Zipline course will revive your love for the sport. It’s carved into natural terrain, using cliff ledges and steep wooded forest for launch and landing. Run down a sloping cliff and hurl yourself into the air above a rocky gorge for a pulse-quickening flight at 6,500 feet. Feeling extra adventurous? 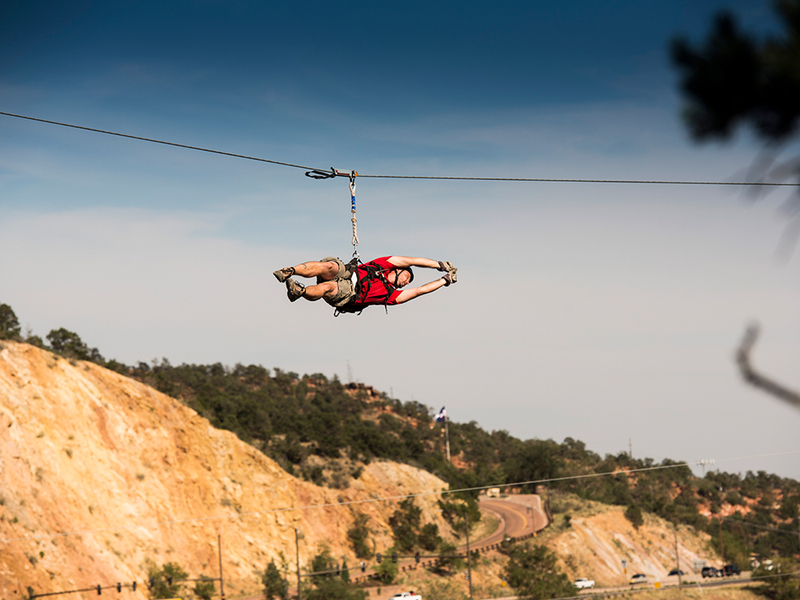 Fasten in upside-down a la Spiderman and see Colorado from a totally new perspective. You can even zipline in winter (adventure doesn’t take snow days, after all). A short (and scenic) ride from Colorado Springs brings you to one of the most legendary whitewater-rafting destinations in the country: the Arkansas River. Together with the rafting experts at Echo Canyon River Expeditions, Adventures Out West offers a full day of thrilling off-roads and rapids for every experience level. 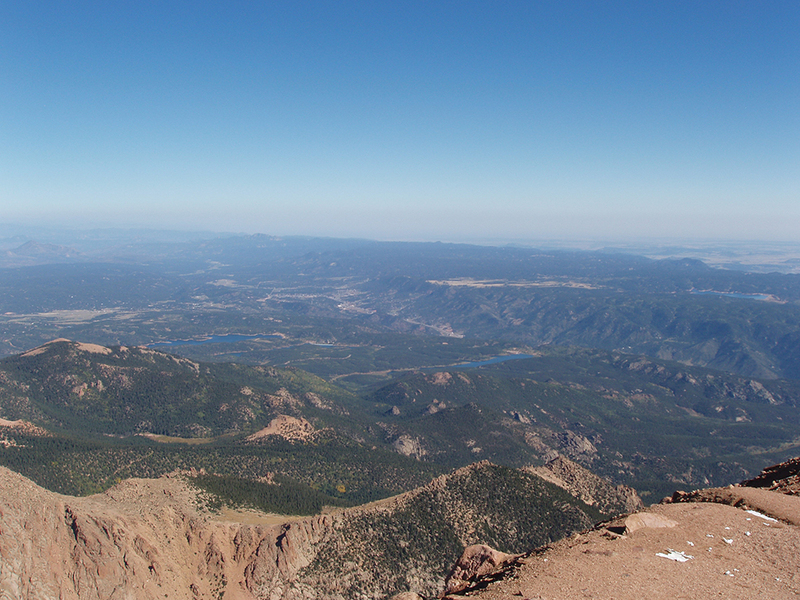 You’ll climb into a Jeep for an early-morning departure from Colorado Springs, traversing the south shoulders of Pikes Peak on the way to your rafting destination: Royal Gorge or Bighorn Sheep Canyon. With its narrow passages and demanding Class IV and V rapids, Royal Gorge is a thrilling, once-in-a-lifetime adventure for experienced rafters only. No less beautiful is Bighorn Sheep Canyon, where beginner and intermediate rafters can paddle gentler (but still exciting) Class II and III rapids through iconic Western landscapes. If you only see Colorado from the main roads, you’re seriously missing out. With some expert guidance, you can venture far beyond the highways and crowded trails to take the ride (or hike) of your life. Who needs pavement? Hop into a custom Jeep 4X4 and hit the dusty trail to Colorado’s lesser-seen corners and prettiest views. On a Garden of the Gods & Foothills Tour, you’ll pass through historic Old West mining towns, visit a 2,000-foot waterfall, traverse Mars-like red-rock formations and drink in views that inspired the song “America the Beautiful” atop a high mountain ridge. If you don’t mind a little more bounce, buckle in for a High Country Extreme Jeep Tour and be rewarded with mountain vistas seen by only the most adventurous travelers. With so much amazing hiking in Colorado (think thousands of miles of trails), it’s tough to know where to start. As the only tour provider with hiking permits in Pike National Forest, Adventures Out West guides know every nook, cranny and wild critter of this breathtaking subalpine wilderness. Hikes range from two to six hours with trails for every hiker, whether you prefer a laid-back stroll or a strenuous trek. Why should the mountains have all the fun? Gain some serious altitude on these high-flying Adventures Out West tours — no experience required. Get up there — way up there — on a group or private hot-air balloon ride. You’ll climb into the clouds and float for an hour, getting a rarefied view of Colorado’s rolling plains and mountain panoramas. Pick from flights above Colorado Springs or South Park, an epically beautiful high valley that looks like the backdrop for every classic Western. Balloon rides are also a special treat for occasions like birthdays and anniversaries. Feeling really romantic? You can even tie the knot in-flight! You’ve seen Pikes Peak in the distance along the Front Range. You may have even ridden its cog railroad — the highest in the world — to the top. But you’ve never seen it quite like this. One of the tallest peaks in Colorado, “America’s Mountain” reveals 14,115 feet of adventure. After a hotel pick-up, you’ll ride the cog railroad to the summit and then hop in a Jeep for an adventure down the north and west faces of the peak. Throughout the wild, white-knuckle ride, there will be photo ops and wildlife spotting aplenty. Is there any better way to relive the Old West? Colorado’s expansive valleys practically echo with the clip-clop of cowboy history. Saddle up for an equine adventure out west. Jeep to the stables, ride off into the distance — Adventures Out West Horseback & Jeep adventures offer two iconic ways to see Colorado in one great tour. Begin with a breezy, open-air Jeep ride on the historic Old Stage Road, traversing historic railroad tunnels on your way to the Old Stage Riding Stables. Led by a trusty cowboy guide, you’ll mosey through forested trails and rocky vistas, watching for elk and bighorn sheep along the way. Head to Adventures Out West to browse complete tour offerings and book your tour today.